The US State Department announced today that it has added three chapters of Ansar al Sharia, as well as three of the groups’ leaders, to the government’s terrorist designation lists. Ansar al Sharia groups in Benghazi, Derna, and Tunisia were designated as foreign terrorist organizations, as well as specially designated global terrorist entities. Ben Qumu is described as “the leader” of Ansar al Sharia Derna, while Khattalah is “a senior leader” of Ansar al Sharia in Benghazi. Seifallah Ben Hassine is the founder of Ansar al Sharia in Tunisia. The State Department says that Ansar al Sharia Tunisia “is ideologically aligned with al Qaeda and tied to its affiliates, including AQIM” (Al Qaeda in the Islamic Maghreb). The designation confirms The Long War Journal’s reporting on Ansar al Sharia Tunisia’s connections to the al Qaeda network. AQAP’s tenth edition of Inspire magazine featured the September 2012 assaults on US diplomatic facilities. All three Ansar al Sharia organizations were involved in assaults on US diplomatic facilities in September 2012. The Ansar al Sharia groups in Derna and Benghazi were both “involved” in the “September 11, 2012 attacks against the U.S. Special Mission and Annex in Benghazi, Libya,” the State designation said. US intelligence officials have previously told The Long War Journal that some of Ben Qumu’s men took part in the Benghazi attack. The US government has reportedly issued a sealed indictment against Khattalah because of his alleged role in the assault. Al Qaeda has praised the September 2012 assaults on US diplomatic facilities in Benghazi, Cairo, Sanaa, and Tunis. In November 2012, al Qaeda emir Ayman al Zawahiri released an audio message praising the assaults as “defeats” for the US. “They were defeated in Iraq and they are withdrawing from Afghanistan, and their ambassador in Benghazi was killed and the flags of their embassies were lowered in Cairo and Sanaa, and in their places were raised the flags of tawhid [monotheism] and jihad,” Zawahiri said in the message, which was translated the SITE Intelligence Group. The 10th edition of al Qaeda in the Arabian Peninsula’s Inspire magazine celebrated the September 2012 attacks. The cover picture showed a black flag, similar to those used by al Qaeda-affiliated groups, being raised in front of one of the embassies. 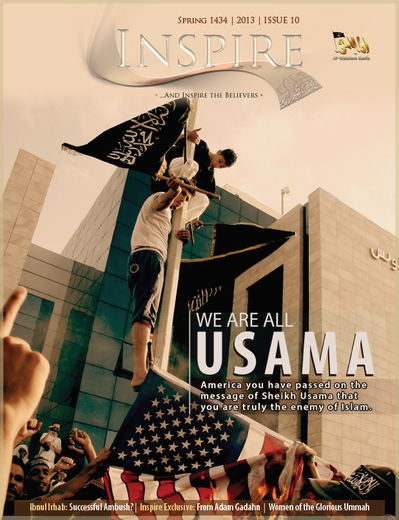 The feature article was titled, “We Are All Usama,” a reference to the chant heard in Egypt, Tunisia, and elsewhere. Ben Qumu was previously detained at Guantanamo. A leaked threat assessment authored by Joint Task Force Guantanamo (JTF-GTMO) includes many details about his pre-9/11 career. JTF-GTMO’s analysts concluded that Ben Qumu was one of the original “Arab Afghans,” and followed al Qaeda from Afghanistan, to Sudan, and then back to Afghanistan and Pakistan as the group relocated the headquarters for its operations. JTF-GTMO found that Ben Qumu worked as a driver for a company owned by bin Laden in the Sudan, fought alongside al Qaeda and the Taliban in Afghanistan, and maintained ties to several other well-known al Qaeda leaders. He is described as an “associate” of bin Laden’s in the file. In August 2012, just weeks before the Sept. 11, 2012 attack in Benghazi, Ben Qumu was identified in a report published by the Library of Congress as the possible “new face of al Qaeda in Libya despite” his denial of an ongoing al Qaeda role. The report (“Al Qaeda in Libya: A Profile”), which was authored by the Defense Department’s Combating Terrorism Technical Support Office, also noted that Ben Qumu and his Ansar al Sharia fighters are “believed to be close to the al Qaeda clandestine network” in Libya. According to the report’s authors, that same network is headed by al Qaeda operatives who report to al Qaeda’s senior leadership in Pakistan, including Ayman al Zawahiri. Seifallah Ben Hassine has his own longstanding ties to al Qaeda. In 2000, Hassine became the co-founder of the Tunisian Combatant Group (TCG), which was established with help from al Qaeda’s senior leaders. The relationship between the TCG and al Qaeda has been explained by the United Nations, which notes that the TCG was created “in coordination with” al Qaeda. Ben Hassine reportedly met with both Osama bin Laden and Ayman al Zawahiri prior to the Sept. 11, 2001 terrorist attacks. And the TCG was implicated in the Sept. 9, 2001 assassination of Northern Alliance leader Ahmed Shah Massoud, who was killed by two Tunisians pretending to be journalists. Massoud’s assassins were given forged passports by a senior TCG member. The assassination was an integral part of al Qaeda’s Sept. 11, 2001 plot, as Massoud was a key Afghan leader opposed to the Taliban and al Qaeda. Massoud’s death, therefore, eliminated an American ally from the battlefield before the fight for Afghanistan even began. While many TCG members and leaders were designated by the US and the UN as al Qaeda-affiliated terrorists years ago, Ben Hassine somehow escaped being designated until today. Some of the other designated TCG leaders went on to hold prominent positions within Ansar al Sharia Tunisia after their release from prison in 2011. One of these TCG leaders is Sami Ben Khemais Essid, who was the head of al Qaeda’s operations in Italy until he was arrested in early 2001. The State Department has previously reported that Ben Khemais plotted against the US Embassy in Rome. Ben Khemais is now a senior Ansar al Sharia Tunisia leader. The State Department concludes that the three Ansar al Sharia groups continue to threaten US interests. Ansar al Sharia, al Nusra front, Shabaab, they’re all AQ. We know that OBL wanted to rebrand AQ into something that could plausibly be denied as being AQ, and also something that was more palatable to muslims. That’s exactly what these groups are. Say what you want about the Iraq war being illegal because it was done unilaterally and without a UN mandate, but that’s exactly what we need more of. Not attacking Iraq mind you, but doing things unilaterally, vis a vis the raid in Tripoli, Libya that nabbed AQ’s chief in that country. More raids, more drones, more hard and fast action that leaves the rotten, stinking corpses of these sorry excuses for human beings in there wake. We need to do these things no matter what any body says or thinks about it. This is one of those things in life where you are either with us or against us. We need to revive our tenacity and aggressiveness, in both the military and government, and also in the public opinion of our people. Al Qaeda is very much alive and thriving in fact in many places around the globe, it’s no where near being defeated, and we can either deal with them now or later but we will definitely have to deal with them at some point. Our tenacity and aggressiveness is toast. To many fools are aligning with the admin. It’s not the same as it was in 2005. The most successful approach that I can see now… we need to gather intel like it’s cool for 3 years. The next admin will be more normal. We can move forward then. We will need to re-cultivate a proud military meme. It’ll actually take a very comprehensive outlook of the current perception of our forces. The internet has changed so much.